Long Island, New York offers some of the most beautiful parks anywhere for casual, natural, outdoor wedding photographs. Some of my favorite locations that come to mind immediately are Old Westbury Gardens in Nassau County, The Planting Fields Arboretum in Oyster Bay and this, one of my favorite places, The Bayard Cutting Arboretum in Oakdale, NY. It never ceases to amaze me that local photographers continually ask me where I take certain pictures of mine when they have been to The Bayard Cutting Arboretum themselves on numerous occasions. They’re probably just going to the same convenient spots in the park on every visit, doing the same old shots time and again. This park is nearly 800 acres in size and when you spend a little time exploring it you can find some really amazing spots. I love this particular spot which is just a short four or five minute stroll from the parking lot. 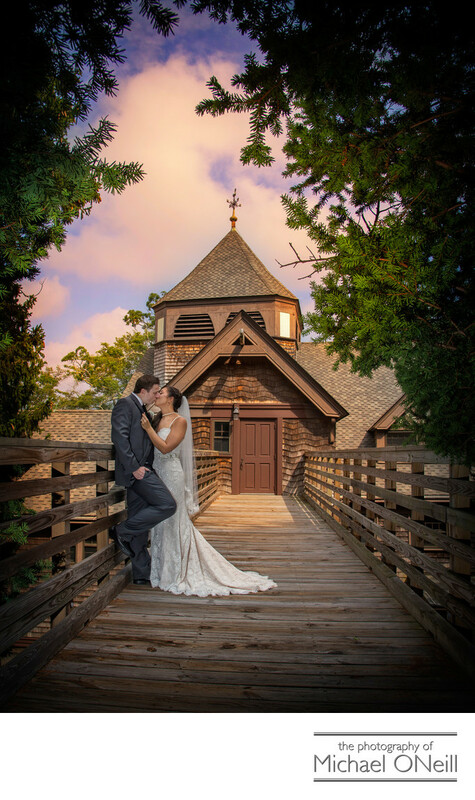 It is actually a maintenance building on the property but, when photographed from this angle, makes a lovely backdrop for an intimate, romantic wedding picture. Best to visit this place with a wedding photographer who thinks outside the box and isn’t afraid of trying something new and refreshing. Wear good shoes if you’re going to explore this place with your photographer. Most of my brides wear a second pair of shoes for their photo sessions in the park. Spend a few minutes looking through the rest of this web site and you will find dozens of awesome wedding photos taken at this great location.